UrgentHomeworkHelp.com will help you in writing your school, college or university homework, assignment, essay, dissertation, case-study, project report, research paper or Ph.D thesis as per your requirement/instructions provided to us at the time of order-confirmation. We will deliver the completed assignment/homework on the mutually agreed date and in the mutually agreed format. As our customer, you can request for a status update on the order placed by you and we will provide you a clear status update. In the rare case that we might need some additional time, the same will be communicated to you well in advance and delivered accordingly. You are requested to provide us with as much details as possible about your homework/assignment. Provide any attachments, reference links etc. wherever necessary so that we can help you better. Your order will be considered to be confirmed only upon your payment of the quoted charges on our website. As soon as you make the payment, we will provide you with a unique reference number, for tracking. For confirmed orders, we will quickly idenfity the right resource/expert/writer and deploy the most suited resource to write your assignment. Customers are not allowed to directly communicate or attempt to communicate with our homework assignment writers/experts. All communication to the experts should be routed through the respective Account Manager assigned to you. If you need any changes done to the completed assignment homework written by our expert(s), you can request for an unlimited number of free revisions within 72 hours after delivery - provided you had initially given with all relevant details about your assignment. New requests for change will be charged extra. We take care to make sure all assignments are completed and delivered on time. If any specific clarification is requested on any part of the completed and delivered assignment, the request will be forwarded to the concerned expert and the response will be duly shared with the customer. The turnaround time could depend upon the availability of the expert concerned. 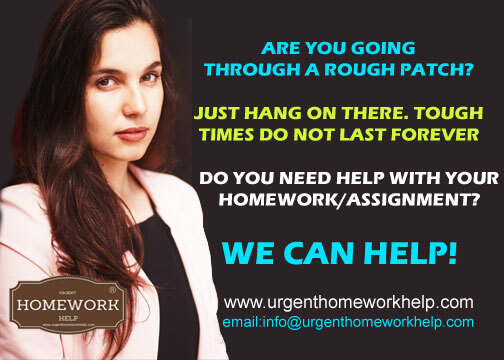 For any escalations, please email us at support@urgenthomeworkhelp.com with a detailed description of your problem along with the assignment/order number. The escalations team will generally respond within 24 hours. CLICK HERE FOR AN INSTANT, FREE QUOTE FOR EXPERT HELP WITH YOUR COLLEGE OR UNIVERSITY HOMEWORK AND ASSIGNMENTS. You can also chat with us on our website any time of the night or day and tell us exactly what you need and when. Share any relevant documentation. Tell us if you would like us to follow any particular referencing style. Specify the word count. We like to keep things simple and straight-forward. No complicated processes or extended wait times. No need to chase us for status updates - we will keep you updated with progress at every stage. No surprise delays or price-hikes. No putting up with rude and arrogant customer care executives. We are absolutely committed to delivering your completed assignments on time, every time.